truthjihad.com blog: "Come all of you cowboys, and fight for your land!" "Come all of you cowboys, and fight for your land!" 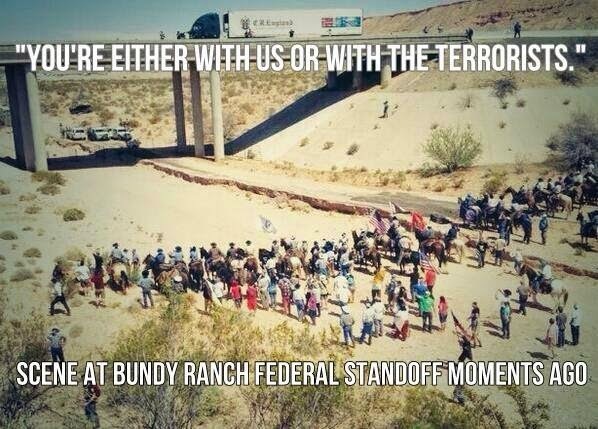 This just in from poet and metaphysician Charles Upton on the Bundy Ranch stand-off. Here's a little something I just wrote today. A friend sent me an email about how the Feds stole a herd of cattle from that Nevada rancher, and how militias from around the U.S. are coming to his aid. It looks like a range war may be shaping up. That made me remember Woody Guthrie's song "Ranger's Command", and think how perfectly appropriate it is for the present circumstances. Woody, a darling of the Left, who put a sign on his guitar reading "this machine kills Fascists", wrote a song that's totally in the spirit of a cause now being adopted by the Right-wing militias. I am a Patriot and a Tea party man. The real fight is not between Left and Right but between Up and Down. Wherever the oppressors are, I am against them. Wherever the downtrodden are, I am with them.